The Smith Smarties went on an adventure-filled scavenger hunt around Rome, looking for as many letters in the alphabet that they could find. 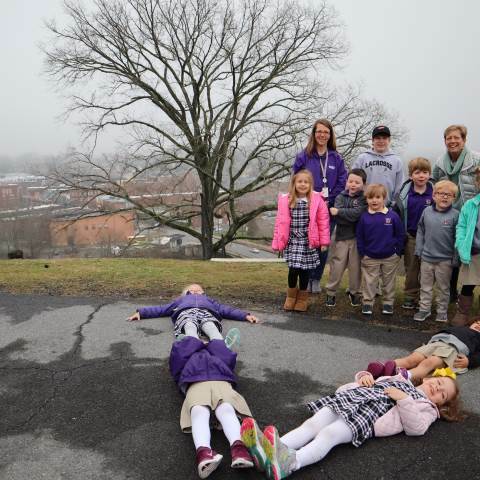 Their quest led them to favorite Rome landmarks like Myrtle Hill Cemetery with a beautiful view, the trails along the river, two bridges, Opera Alley, the Rome Fire Department, the Capitoline Wolf, and MANY more. Lunch was picked up from Zaxby's along with a treat to finish the day at Krispy Kreme. After lunch, the students burned off some energy on the Darlington campus as they looked for the rest of the letters in the alphabet.